1) SOHA SARDINIA HYDRA MARIS GEL-CREAM: a great hydrating face cream that deeply moisturizes and soothes the skin. I apply it every morning on the clean skin, which soon turns soft to the touch; it can be used even after the sun exposure for the good soothing effects. It smells amazing, like the sea of my beautiful and beloved Island, and absorbs quickly. It's just ideal for summertime. 2) BENEFIT COSMETICS PRECISELY, MY BROW PENCIL: a ultra-fine eyebrow pencil that precisely shapes and defines with just few strokes. Eyebrows are my obsession and this product is truly the best I ever used: it works great and it's perfect to get a natural or bold brow look, depends on the finish you prefer; the brush helps to blend really well. I'm totally loving it, that's why I highly recommend it. 3) BENEFIT COSMETICS BOI-ING AIRBRUSH CONCEALER: a waterproof and lightweight concealer that perfectly covers all the imperfections, dark circles or blemishes, making the skin look flawless. The formula is super creamy, easy to apply and to blend. I'm really impressed with this concealer and I'm using it on all over my face, like a foundation. 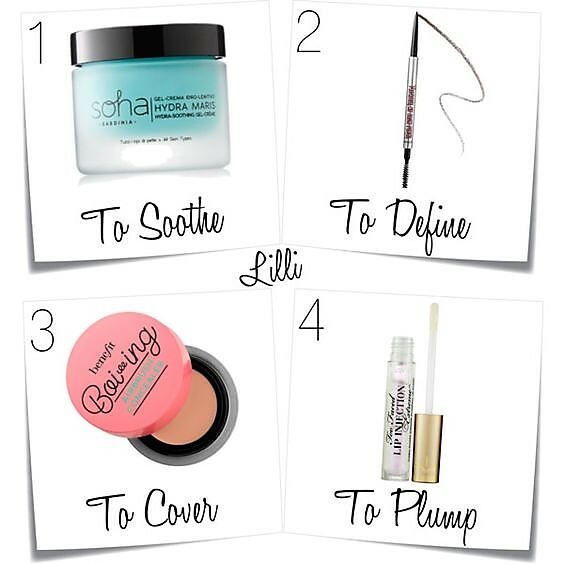 That Soha cream sounds so nourishing and soothing! No wonder it's become one of your summer loves Lilli! I need to find something like that as well. Happy weekend babe! Hi Lilli, these products look great. I like the gel cream and the brow pencil. Enjoy the weekend. Quella matita sopracciglia deve essere mia! Hi Lilli, I like it when the eyebrow pencil leaves a natural effect so this is my favorite of your selection. Happy weekend dear! Direi che sono tutti da provare, mi sembrano ottimi! The lip plumper sounds very intriguing. Would love to try a product like this one to see the effect!